2 Bedrooms, Bathroom, Shower room, Day room, lovely kitchen, private garden. 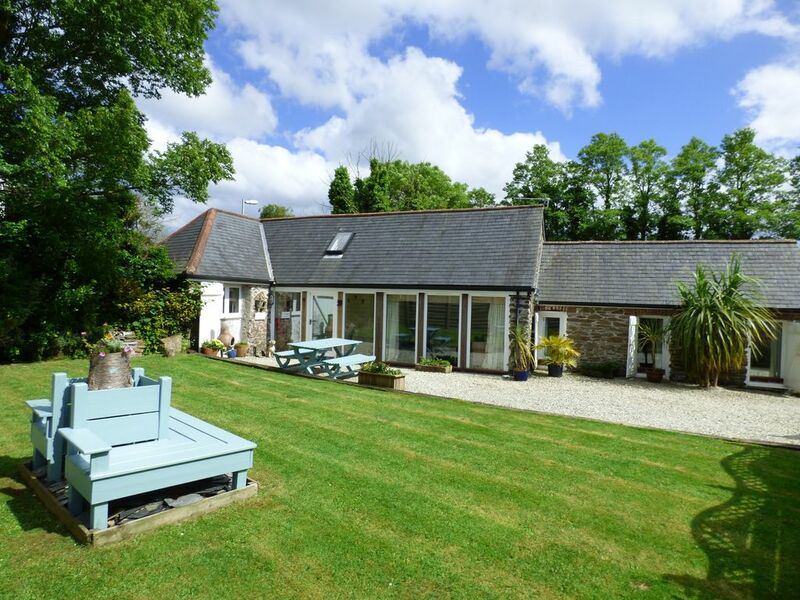 A delightful and luxurious conversion of an old farm building located in the peaceful village of St Ewe at the northern end of the idyllic Roseland Peninsula, a short distance from the Lost Gardens of Heligan and the quintessential Cornish fishing village of Mevagissey. Also just a few minutes drive from from some of the best beaches that the south coast of Cornwall has to offer. Ermintrude Cottage has been skilfully converted by the Owners from an old farm building into a beautiful two bedroom holiday home. The attention to detail is outstanding and you will very soon feel at home in this relaxing and peaceful location. The cottage has a good sized kitchen with a comfortable sitting area and also a separate living room. Ermintrude can be easily accessed from it's own off-road parking area, and, with the exception of the first floor attic bedroom, it is all on one level, and so is fine for those who do not enjoy steps or steep inclines. The cottage is dog friendly with a great enclosed garden and some fabulous dog walking country nearby. The location in St Ewe is ideal for those looking to visit the Lost Gardens of Heligan, Mevagissey, the Roseland Peninsula or the Eden Project, which is just a short drive away in St Austell. The nearby coastline is stunning and the coastal footpath in particular is spectacular. There are also some delightful beaches nearby including Pentewan, Gorran Haven and Porthluney Cove near Caerhays Castle. Lobbs Farm Shop at Heligan also provides excellent local produce. Ground Floor: Entrance lobby with door to kitchen / living room at one end. The kitchen is extremely well equipped and really quite spacious, with a family dining table and chairs. The living area has a very comfortable corner sofa, a TV and DVD player and a large wooden box full of games and puzzles. From the other end of the entrance lobby there is a door through to a day room with lovely comfortable furniture and floor to ceiling windows - a perfect spot to sit and enjoy the view onto the garden. One of the sofas converts into a sofa bed. The Master bedroom is luxuriously appointed with a 6' zip & link bed that can be split into two single beds upon request. The cottage includes two separate bathrooms, both containing WC. One bathroom is an en-suite attached to the main bedroom and contains a gorgeous roll top bath. The other is equipped with a good shower. First Floor: A small twin bedroom, converted from the attic space, is accessed via the stairs and has quite restrictive headroom. It is absolutely ideal for children, slightly cosy for adults, but not uncomfortable. It can be made as a double or twin room on request. Exterior: An enclosed garden with external furniture and a built in space for disposable BBQs. Jeremy and Mel Upton have lived in Cornwall Since June of 2014. Prior to that we lived for many years near Brighton in West Sussex. We are really enjoying our new life in Cornwall so far, and we are, if anything, even more in love with this beautiful part of the world now, than we were when we first arrived. You will be most welcome! Thanks for leaving the cottage so clean and tidy. A beautiful, modern cottage...a perfect getaway! We really enjoyed our stay at Ermintrude Cottage and didn't want it to end. The welcome box was a lovely touch. The Cottage has been finished to a very high standard and had everything we could have needed. A great secure garden for the children to play in. A great place to stay and we hope to be able to visit again! It was an absolute pleasure to have you and your family staying at Ermintrude Cottage. You would be most welcome back at any time. Thank you for leaving it so clean and tidy. Well equipped cottage. Downstairs ensuite bedroom is great for adults whilst the upstairs room is perfect for children or perhaps one adult (due to restricted headroom). Excellent safely enclosed garden which would be lovely for warm weather. Our stay was wet and windy so just looked at the garden from the inside. Parking in the driveway might be slightly tricky for large vehicles but there is easy street parking if needed and the owner did offer alternative parking on his property. It's a very nice cottage, very well equipped with everything you need. Garden and house in very good condition, parking on-site. Situated in a small village with a nice pub, good location for exploring Cornwall. Fenced garden good for children. WLAN sometimes goes off. Dog-friendly place. It was a pleasure to have you and your lovely family come to stay Isabel. Do please come again. sehr gut ereichen.Sehr nette Vermieter,wir kommen wieder!! It was an absolute pleasure to have you and your lovely family staying at Ermintrude Cottage. You would be most welcome at any time. The village of St Ewe is situated approximately 5 miles south west of St Austell. It boasts a very good pub called the Crown Inn which serves food. Local attractions include the Lost Gardens of Heligan just a few minutes down the road, the Eden project, the beautiful Cornish fishing village of Mevagissey, Caerhayes castle, Gorran Haven, numerous fabulous beaches and many miles of spectacular cliff walks along the coastal path. Also, of course Falmouth and St Mawes and the wonderful Roseland peninsula. Centrally located in Cornwall Ermintrude's guests have used it as a base for visiting all parts of the county. From St. Michael's Mount and the Minack Theatre in the East to Looe and Bodmin moor in the West. Also of course the beaches of the North coast are only a short drive away across country if you fancy some surfing or body boarding. The tiny seaside village of Mevagissey is packed with old Cornish cottages complete with narrow alleyways leading to converted fish cellars offering gift shops, galleries, pubs and cafes. Once a major Pilchard port, now the harbour boasts a smaller fleet, many of which provide sea tours, or boat trips to Fowey situated further up the South coast. The Harbour provides an ideal back drop for a fish and chip supper, followed by a stroll through the town at dusk. Gorran Haven nearby offers an alternative day out as does Pentewan with its fresh water dock basin, or continue south along the coast to Caerhays Castle and Porthluney Cove. St Austell is about a 15 minute drive away from St Ewe and is the central location for visiting the South East of Cornwall. With large attractions such as the Eden Project and Charlestown on the outskirts, it offers a number of places to visit. Once the major producer of the worlds China Clay, that industry is now in decline as a result of cheaper foreign imports, but The Wheal Martyn China Clay Museum set in two former working pits depicts the countryside in years gone by. Wet weather activities could include the visitor centre at St Austell Brewery, sampling beers and ales made on the premises. The brewery has recently started exporting their products across the Tamar River to England, so you may just find where your favourite brew is made. The coastal town of Fowey is further up the coast past the china Clay port of Par, offering fabulous restaurants, galleries and gift shops. A short car ferry across the river takes you on to Polruan. Daphne du Maurier spent her later years in properties in and around Fowey, a festival of her works takes place each May. Nearby you can visit the beaches at Menabilly the real-life manifestation of Manderley from her most famous novel Rebecca. In the other direction the Roseland Peninsula is an Area of Outstanding Natural Beauty and forms one of the finest sections of Cornwall's South Coast. From Mevagissey to St Mawes and bordered by the Fal Estuary to the west, the Roseland Peninsula has been drawing visitors for years with its splendid coastline, unique gardens, historic villages and superb sailing waters. A truly magnificent part of Cornwall, the Roseland Peninsula is a wonderful place to visit. St Mawes Castle, built by Henry VIII in the 16th century sits on Castle Point at the mouth of the River Fal. At the top of St Mawes, Lamorran Gardens house a wonderful collection of tropical plants with lovely views down into the Harbour. St Just-in-Roseland has arguably the most photographed church in Cornwall, built in the 13th century it sits quietly tucked away on the edge of the creek. The Veryan Roundhouses are a must see, on the way to Nare Head, where you will find the most spectacular views of Gerrans Bay. The little village of Portloe nestles in lovely valley and is one of Cornwall's quintessential spots. Portscatho has a number of art galleries and many artists find the light in this harbour village inspires much of their work. The Roseland Inn at Philleigh is a 16th century pub just waiting for you to visit. The most popular thing to do though on the Roseland is simply to walk and enjoy some of Cornwall's most beautiful coastline.